Management Issues: The MCMUA transfer stations cannot accept creosote treated utility poles and railroad ties unless the wood is significantly rotted to the point that most of the creosote has leached out of the wood and the wood is cut into sections no bigger than three (3) feet in length. 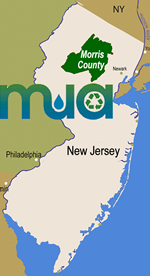 Regulations: NJDEP approves power generating facilities to receive N.J. Generated chemically treated wood scrap for incineration and energy recovery. This type of wood is often not accepted through the transfer stations.